Take in the often-overlooked delights of Italy’s sun-kissed southern ‘high heel’ on this unique and delightful escorted tour. After a night in Caserta, head east to the blue Adriatic and discover the caves at Matera, stunning hill-town Ostuni, Alberobello and Lecce, before heading up the coast, via historic Bari, to spend two nights on the very tip of the spectacular Gargano peninsula, in Vieste. Fly to Naples, and then make the short journey to Caserta, site of the ‘Versailles of Naples’ – the vast Royal Palace – to spend your first night in an elegant four-star hotel. Today you’ll head south from Caserta. See the unforgettable sights of Matera on an included tour to discover ancient troglodyte cave-dwellings and churches hewn from the rocks, and then continue to Ostuni to spend your next four nights in a four-star hotel overlooking the blue Adriatic. 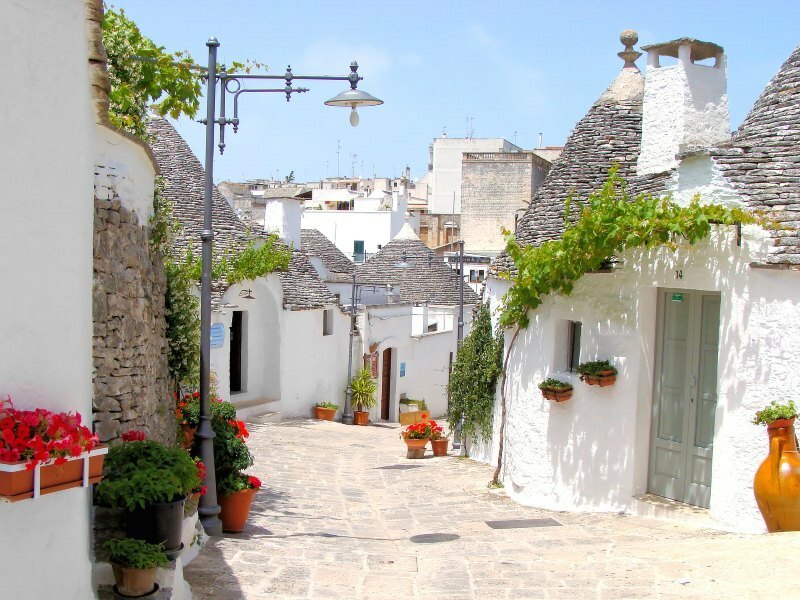 Explore the stunning, white-washed hill-town of Ostuni, with its labyrinthine maze of narrow streets, and see famous Alberobello’s amazing conical trulli houses, today. There will also be time for some wine-tasting, and to sample local delicacies, during a visit to a vineyard. Today brings the opportunity to rest and relax at your hotel, perhaps enjoying a dip in the pool or the sea, enjoying sun in the hotel’s gardens, or curling up with a book. A full-day guided tour will show you the Baroque treasure-chest of Lecce, one of Southern Italy’s most appealing cities. Soak up the atmosphere of this historic trading centre with its elegant buildings, ornate churches and marbled courtyards. Explore the old town, which surrounds the ruins of a great Roman amphitheatre, before we return to Ostuni. Today you will visit Bari – the vibrant Adriatic port and Southern Italy’s second city. The jumble of narrow streets in Bari’s exquisite Old City is a delight with the stunning Basilica di San Nicola – final resting place of the saint known as ‘Santa Claus’ the world over – at its heart. From Bari, you’ll continue to the spectacular Gargano peninsula, which towers island-like above the surrounding coastal plains. After a scenic drive along the southern coast road you’ll arrive at our final hotel, in the popular resort of Vieste, at the tip of the once isolated promontory. Check in, then perhaps head out to explore the bustling old town, before dinner overlooking the Adriatic in the hotel. Today’s optional excursion brings the opportunity to head along the coast, by boat, and visit some of the region’s sea-caves. The Gargano Coastline from Architiello di San Felice to Mattinata is mainly limestone, and is peppered with stunning caves like such as Grotta dei Contrabbandieri (Smuggler’s Cave) and Grotta Sfondata (The Great Bottomless Cave). Bid farewell to Vieste, today, and transfer back to the airport for the return flight to the UK.